Aurora Edington discusses energy storage systems, grid optimization and policy's role in energy issues. 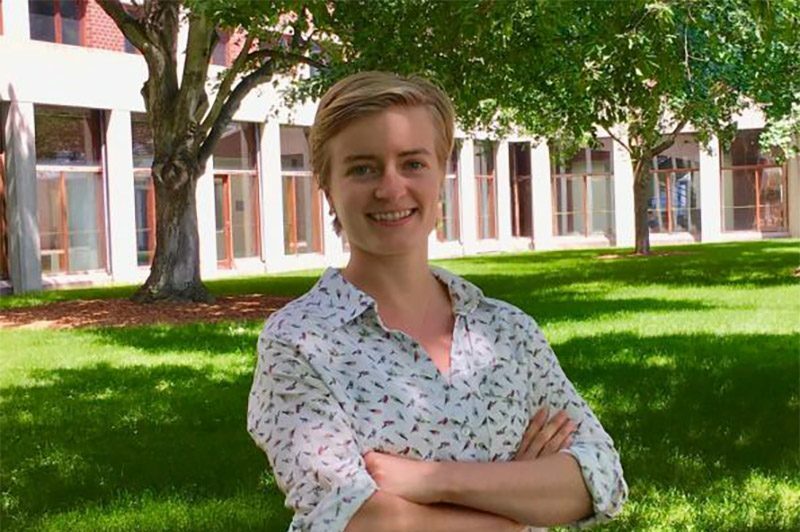 Aurora Edington is a graduate student in the Technology and Policy program at MIT. After graduating from Yale in 2015 with an Environmental Engineering degree, she worked at the Office of Energy Policy and Systems Analysis at the U.S. Department of Energy. ClimateX sat down with Aurora to discuss her projects in energy storage systems, grid optimization, and policy’s role in energy issues. Q: Tell us a little bit about your background in energy studies. While at Yale, I participated in an energy studies certificate program which introduced me to the energy sector and sparked my interest in the field. I had the opportunity to spend a summer in Denmark in the Sustainability Office at the University of Copenhagen. There, I experienced how the Danes integrate sustainability into their lives more holistically than we do in the U.S.
After college, I worked in the Office of Energy Policy and Systems Analysis at the U.S. Department of Energy in Washington, D.C. I worked on the second installment of the Quadrennial Energy Review (QER), an integrated study of the U.S. electricity system and energy policy from generation through end use. At DOE, I learned more about the complexities of the energy sector and the role and importance of policy and regulation in it. I’m primarily interested in studying how the United States can transition to a deeply decarbonized energy system. There are many changes occurring in the energy sector today with distributed energy resources and increasing energy efficiency measures being adopted to meet decarbonization goals. More digitized and interconnected devices provide new operational opportunities and cybersecurity risks to manage. Regulatory regimes continue to shift between regulated entities and competitive markets, and costs for technologies are rapidly changing. Additionally, a growing number of state and federal policies regarding the energy system all play a role in how the sector is evolving. The increase in renewable energy sources is a particularly critical challenge to address in the evolving grid. These sources generate intermittently, since the sun doesn’t always shine and the wind doesn’t always blow. There are a number of ways to address this problem, from increasing the transmission infrastructure to interconnect disparate regions, to managing electricity demand from customers through measures like smart metering. One of the solutions I focus on in my research is using energy storage to shift electricity from times when it is generated to when it is used. My current research explores technical parameters for energy storage technologies on the grid that could supplement variable renewable energy sources to completely meet electricity demand. Through the use of a power system planning model, I plan to find optimal values for characteristics like energy storage duration, energy capacity, power capacity, and round trip efficiency, for future energy storage technologies while minimizing costs. Ideally, these results will then indicate areas where future research and policy might best be directed to optimize energy storage technologies for use on the electric grid and to meet our climate change goals. This type of work is particularly relevant as more federal and state policies encourage the adoption of energy storage onto the grid. Not only can storage help manage the variability of renewable energy and provide a variety of critical balancing services to the electric power system, but it can also help meet our climate change goals more quickly, easily, and at lower-cost than otherwise. Q: What does “sustainability” mean to you, in the context of energy systems? In the context of a sustainable energy system, energy is generated from renewable and non-carbon emitting sources while minimizing waste, pollution, and water and land use impacts. This will require a mix of both local and regional solutions. On the local side, a sustainable energy system would have an increasing focus on meeting demand with greater amounts of local generation. There are a wide variety of customer-sided energy solutions that can help in this transition, from greater energy efficiency to using electricity at times when renewables are available (for example running appliances when the sun is shining) to home storage systems that could shift energy to be used when it is needed on a local level. At the same time, maintaining a regionally connected grid is critical to creating a sustainable energy system. Areas with a large load demand, like cities, are nearly impossible to meet with only local generation sources, and a connected grid is an important tool in smoothing out uneven demand and generation, as well as for transporting remote clean energy sources like hydropower or large wind farms. Q: What sorts of changes need to happen in the energy sector for climate change mitigation? There is no “silver bullet” solution but rather a number of important changes to make. The imperative to mitigate climate change introduces opportunities to rebuild our aging energy infrastructure for a clean energy future, invest in fundamental energy research that will be critical to future applications, and provide economic opportunities for citizens across the country. State policies and corporate commitments have spurred clean energy investment to date. Yet all players in the sector need to look ahead at the clean electricity system we are moving towards, and plan for facilitating it. If you’re a utility, you can engage customers more actively through installing smart meters, sending more accurate hourly price signals, or facilitating new solar PV interconnection. If you’re a state, you can continue pushing forward clean energy policies and support decarbonization technologies. If you’re a residential energy consumer you can conserve energy through using programmable thermostats or replacing appliances with more efficient versions. On the national level, the Clean Power Plan (CPP) represented promising regulation of carbon emissions from stationary sources, like power plants. This would have sent a strong signal to markets, utilities, and the energy sector as a whole to move away from carbon emitting resources. Of course, the Trump administration has set in motion the repeal of the CPP, bringing federal policy to reduce carbon emissions back to square one. In the absence of the CPP, in the least, we need to incorporate the cost of carbon into financial calculations, whether that’s through cap and trade, a carbon tax, or some other pricing mechanism in the energy sector. Lastly, we also need to prepare for increasing electricity demand as other sectors, like vehicles in the transportation sector, electrify. The past several years have seen a flattening or even decrease in total electricity demand due to energy efficiency gains. Yet, I think that electricity demand is about to start rising again, especially as electric vehicle numbers increase and charging infrastructure is built-out. This reinforces the importance of setting up a system that will build the new generation that is required to meet our climate change mitigation goals. This interview was originally published in ClimateX.